When The Predator arrived, we knew we had our hands full. Not just because he’s a sports hunter who prefers human prey, but because along with him comes a beloved 30+ year old franchise with a rabid fanbase that desires big action, and even bigger kills. We needed to reassure these fans the movie they were going to see was the same pulpy, over-the-top fun they remembered from the original film. So, with a collection of bloody cinemagraphs, action-filled trailer cutdowns, Instagram stories that let followers choose their own kill and Versus content that pitted The Predator against pop culture character icons, we did just that. Starting with trailer footage, still photos, and focusing on thrilling, R-Rated death and destruction, our motion fx and design teams whipped up organic content to help fans pre-game for the premiere. We also armed each member of The Predator’s ensemble cast with their own unique batch of social content. These included short, loopable character videos and cards that gave fans another piece to who each actor was playing. Today’s the day - the @predator is finally here. Get your tickets now! He’s back in 2 days... @predator, in theaters this Friday 9/14! 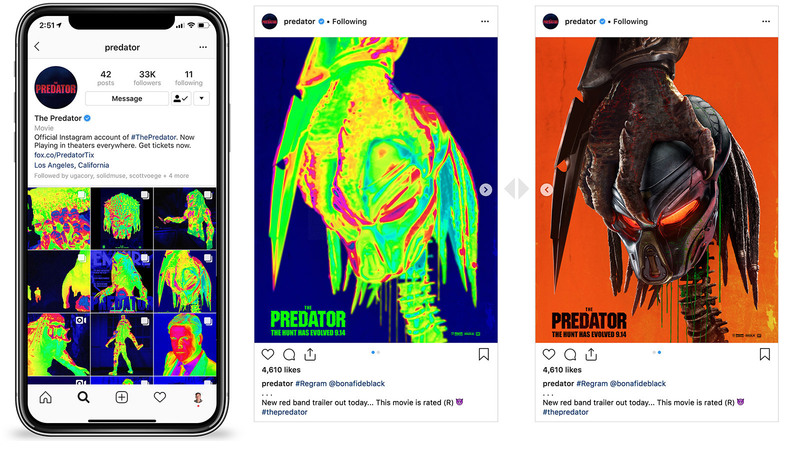 With The Predator’s preferred hunting technique in mind, we created an entirely thermalized Instagram account where each post featured two pieces of content: An image that made it look like The Predator was on the prowl and then a trailer cutdown, motion fx piece, cinemagraph or character featurette for diehard fans to devour.